I kid you not when I say this will be the best Italian chopped you’ve ever had. Why? You ask? First off- it’s an Italian chopped salad, which in itself can do no wrong. 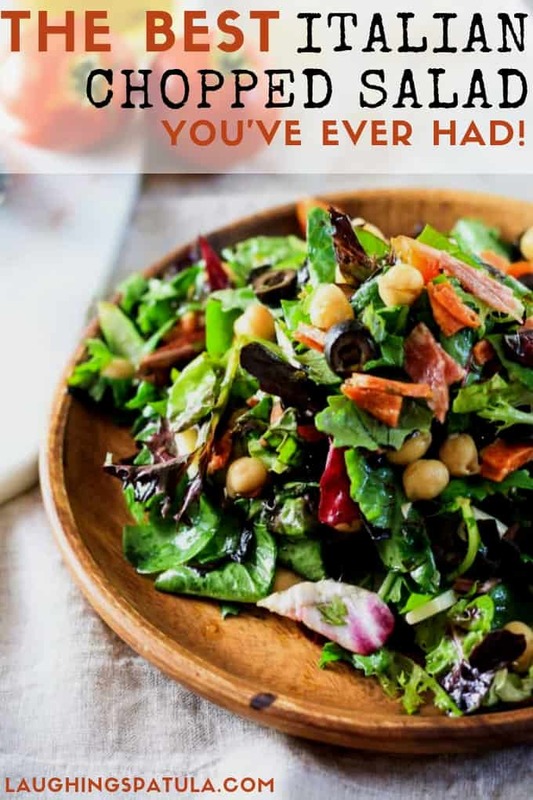 It’s chock full of Italian goodies, AND it’s healthy AND this recipe includes a delicious, do-it-yourself Lemon Basil vinaigrette. I know, you’re saying to yourself “mio dio che sembra così buono”, and I just can’t blame ya! Some Chop chop choppin’ and this Italian Chopped Salad is ready to go. Wee! Simple, easy and healthy…just how we like it. *That’s Italian for ‘my god that looks so good’. I had all of the ingredients to this Italian Chopped salad in my fridge and decided I needed a nice healthy lunch. I also had just bought this lovely wooden plate from Crate and Barrel and needed something pretty to put on it! 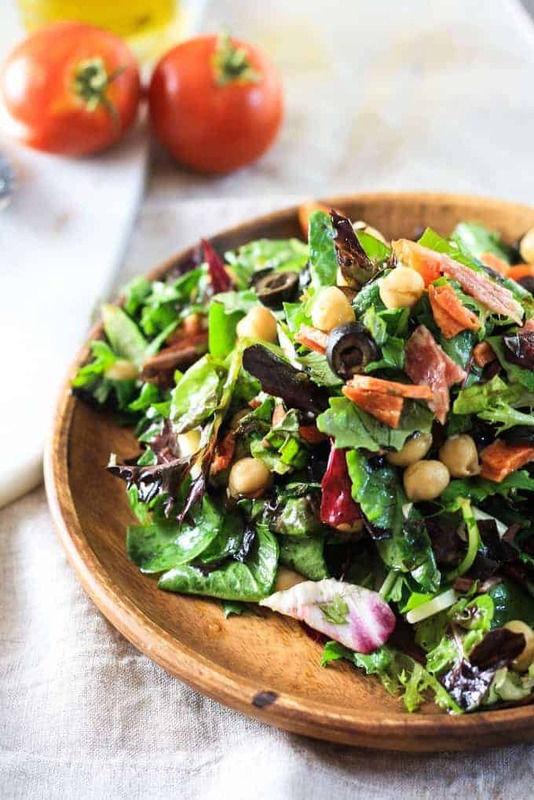 Yummy chopped, hearty ingredients make this salad really filling and delicious! The key to this delicious, restaurant quality Italian Chopped Salad is using really good lettuce- you want it fresh and crunchy. I use Trader Joe’s Organic Herb Salad Mix. Oh! Don’t forget to use FRESH basil in this. It makes a world of difference and really adds to the flavor. The fresh basil gives this salad an extra flavor punch. SO delicious! Chop your veggies, make a little dressing, and you’re good to go. This Italian Chopped Salad is one you DO NOT want to miss. Seriously. So flavorful and its perfect for any season. If you’re trying to get your kids to eat it, call it “pizza salad” and toss it in some ranch- they’ll love it! 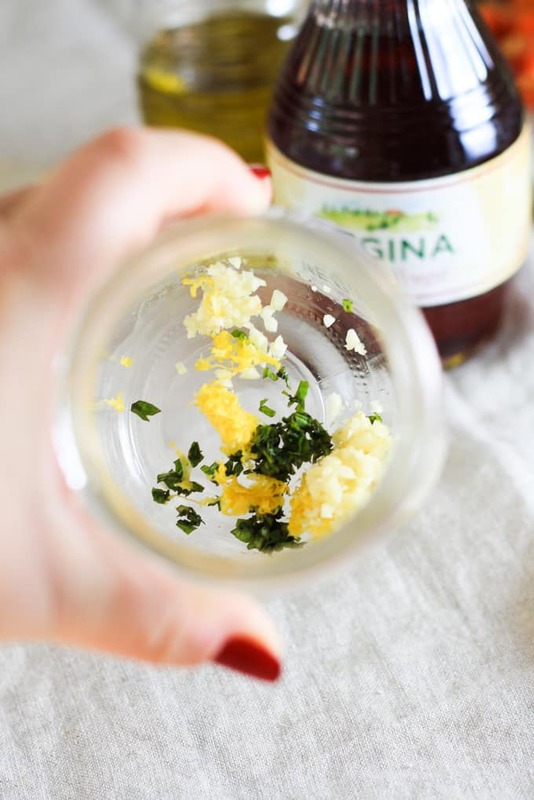 The fresh lemon zest, freshly chopped basil and garlic are what make this vinaigrette so flavorful. 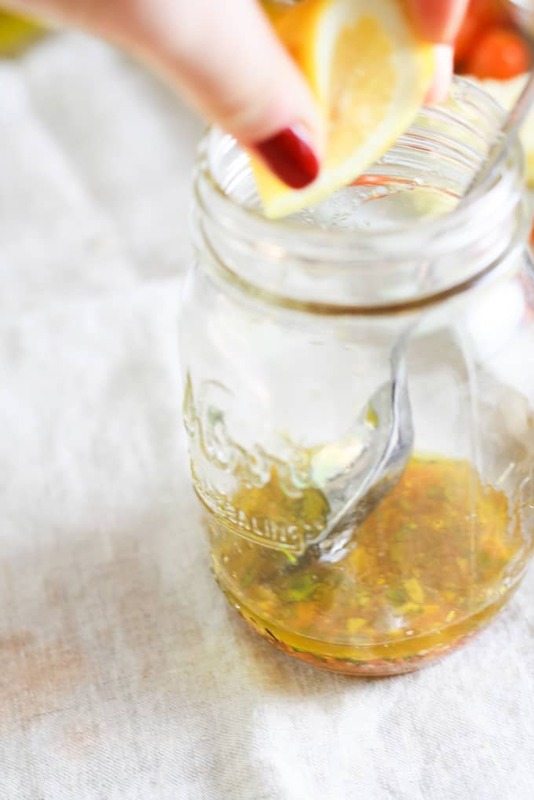 This delicious vinaigrette comes together quickly. And looks cute in a mason jar. just saying. Mix the dressing up, pour over your salad, and toss. Badda boom badda bing! 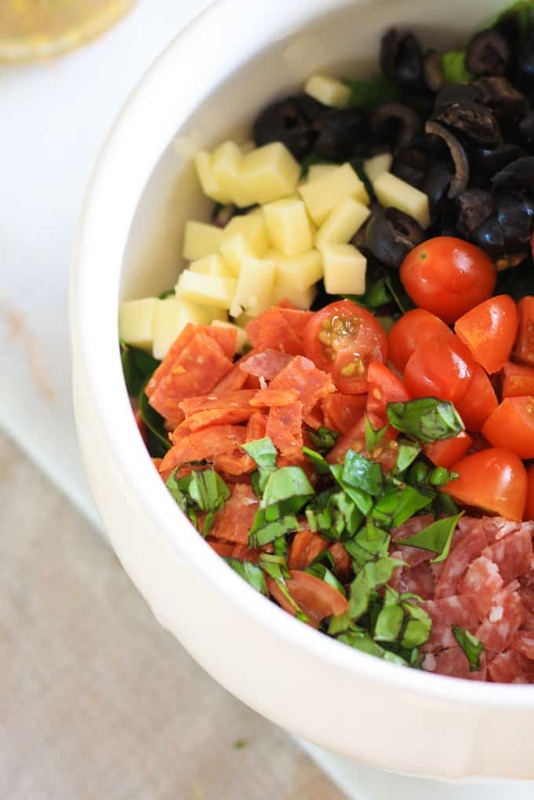 Italian chopped Salad for the whole family! Delicious! Italian Chopped Salad. Serve as a side, or top with chicken and serve on its own! I used provolone in this Italian Chopped Salad, but you could really use any these you’d like. Big shreds of parmesan would be delicious, as would chopped mozzarella. Don’t be scared to substitute! 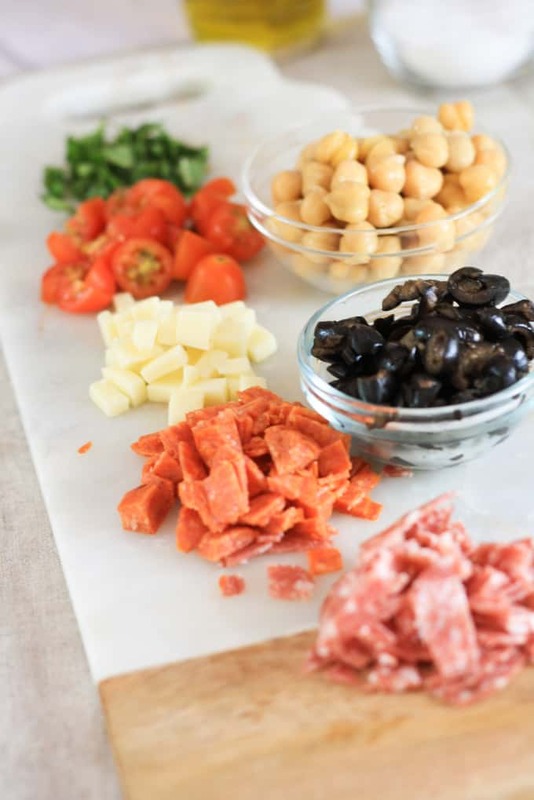 You can really play with this Italian Chopped Salad however you like- Don’t have garbanzo beans? Add in some kidney beans! Not a fan of tomatoes? Leave them out. Add in some radishes, even some chopped purple onions would be delicious in this. Pepperocini’s would be delicious with this, too. My husband doesn’t like them so I left them out. Ugh- the things you do for people you love! Need some extra protein? Top the salad with some chicken breast- THIS Lemon Grilled Chicken would be delicious on it!. Serve this Italian Chopped Salad with some delicious Cheesy Stuffed Garlic Bread! This is the REAL reason I eat salad. So I can have bread. It’s all about moderation, peeps. 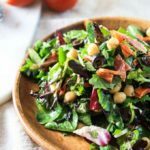 Full of delicious Italian cured meats, veggies, and a homemade lemon basil vinaigrette, this simple, easy and HEALTHY salad is perfect as a main course, OR side dish! 5 oz Herb Salad Mix Found at Trader Joes- Substitute spinach & arugula if you cannot find it. In a large bowl, combine salad, and chopped ingredients. *Tip: If you are transporting to a party, or serving later, avoid mixing the 'wet' ingredients (I.E. garbanzo beans & olives) to prevent sogginess. In a small bowl or mason jar, combine dressing ingredients. Shake well, and let sit for a few minutes to allow flavor to absorb. Toss & serve. Enjoy with toasted garlic bread! I used provolone in this Italian Chopped Salad, but you could really use any these you'd like. Big shreds of parmesan would be delicious, as would chopped mozzarella. Don't be scared to substitute! 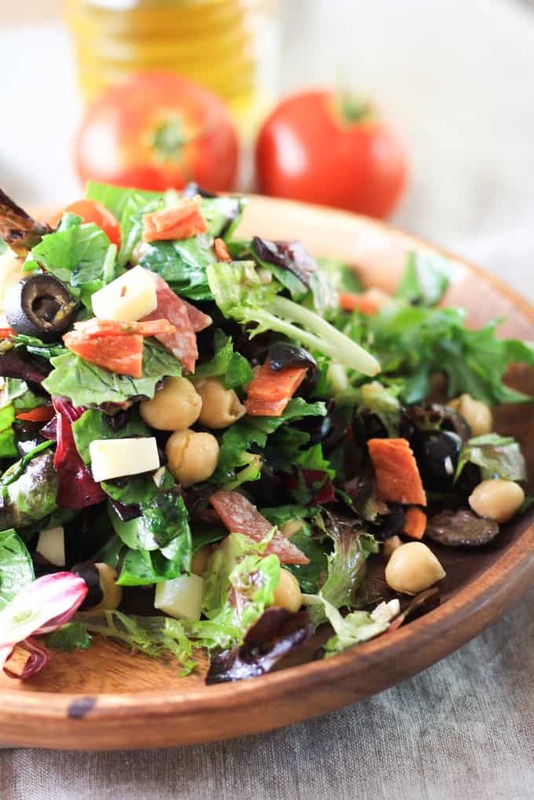 You can really play with this Italian Chopped Salad however you like- Don't have garbanzo beans? Add in some kidney beans! Not a fan of tomatoes? Leave them out. Add in some radishes, even some chopped purple onions would be delicious in this. Pepperocini's would be delicious with this, too. My husband doesn't like them so I left them out. Ugh- the things you do for people you love! Serve this Italian Chopped Salad with some delicious Cheesy Stuffed Garlic Bread! This is the REAL reason I eat salad. So I can have bread. It's all about moderation, peeps.